Based on archived emails, news articles, public records and interviews with more than 20 people, the story of what went wrong in Hollygrove illustrates how the complex, undemocratic state-run school system makes key decisions about what schools will grow in which neighborhoods — with the community’s desires literally tied for the lowest priority. It has broad implications, too, as the Recovery School District determines what other schools will look like – including John McDonogh High in Treme and Sarah T. Reed High in eastern New Orleans — and as the communities there clamor to be heard, to have the new schools bring back neighborhoods. Hollygrove is an isolated place. You don’t drive through it to get anywhere else, and in fact, mostly you can’t. Its few popular attractions are close to its Carrollton Avenue boundary: the farmers market and the Costco. It’s infamous for shootings and Lil Wayne. It’s where Rev. Kevin Brown grew up. His father, a minister, moved the family here in the 1960s. They arrived as the neighborhood began to decline. Brown remembered a childhood of routine and ritual with friends. Every Saturday, he said, “We’d walk down to the K&B and get a Charleston Chew … which is the biggest candy you could buy for the least money. And then we walked down to the Radio Shack and got a free battery, and then we came back and played football.” Why a battery? Who cared: It was free. Joe Sherman’s memories go back even further, to the 1950s. He could stop into any house on the block and feel welcome. At the end of seven of those blocks was Paul L. Dunbar Elementary, a serious and even stern place focused on learning, tucked into the neighborhood like a snail in its shell. Sherman thought it was one of the best schools in the city. August: New Orleans school facilities master plan published. Dunbar will be rebuilt. March: Dunbar building assigned to Lafayette Academy for overflow, but no students ever attend.August: $1.8 billion FEMA settlement announced. December: Draft siting plan does not include Dunbar due to clerical error. KIPP Believe assigned to McNair building on S. Carrollton Avenue. October: Master Plan revised; McNair will not be used as a school. December: Siting plan updated; Dunbar assigned to Banneker, but still no students ever attend; KIPP Believe assigned to Bradley in Gentilly. December: Siting plan updated; Dunbar assigned to KIPP Believe. “When the bell rang you came together: prayer, pledge allegiance to the flag,” he said. His grandfather was the school janitor. If he misbehaved, his fourth-grade teacher would spank his hand with a ruler, and his mother knew before he got home. His formative teacher, Mr. Thomas, became his model of manhood. Following in his footsteps, Sherman joined the Air Force and served in Vietnam. Brown attended parochial schools, then left for college and Chicago. He moved back to Hollygrove in the 1990s and succeeded his father as director of Trinity Christian Community, a religiously oriented social center. Sherman returned in 2003 and found many of the old families still there. But Hollygrove was riddled with decay and crime, “gunshots every day.” The Dunbar campus, a half-century older than Sherman remembered, was decrepit and out of space, mushrooming with drab trailer classrooms. It looked like what it was, a place where children had to struggle against the odds to learn. By the spring of 2005, Dunbar had a school performance score of 49.5 on a 200-point scale and was labeled academically unacceptable. That fall, after Katrina, it became one of more than 100 public schools that were swept out of the Orleans Parish school system into control of the state Recovery School District. To save their neighborhood after the hurricane, Hollygrove’s community groups confected a three-point plan. Two points were to stop the gunshots and to build a new senior center. The third was to reopen Dunbar. For without it, families would not return. With vast quantities of money pouring in after Katrina to fix New Orleans’ sorry public education system, many decisions had to be made, often quickly and not always popular. Most would be made by the Recovery School District, which had taken over four fifths of the city’s schools. Inside the Recovery district offices, hired staff report to an appointed local superintendent, who reports to an appointed state superintendent in Baton Rouge, who reports to a statewide board that is only partially elected. As an institution, it is several layers removed from direct democracy. The Recovery district might ask forgiveness for its actions, but it need not ask permission. It’s meant to focus on the schools at a macro level, the greatest good for the greatest number. And to the current set of Recovery officials, the Dunbar campus was just one of 82 that needed to be filled, none more important than another. The survival of Dunbar was by no means assured. First, the building itself had to be saved, as urban planners embarked on a slash-and-burn of the city’s surplus school campuses. Public school enrollment had declined for 30 years, and many campuses were half empty even before Hurricane Katrina’s displacement. The Recovery district, the Orleans Parish school system, demographers and planners scrutinized every one of the 120-plus school campuses, deciding which would stay and which vanish. When the two school systems completed their joint facilities master plan in 2008, one third of the campuses were eliminated. Dunbar survived. Brown attributes it to neighbors meeting with Recovery Superintendent Paul Vallas in the years leading up to the decision and convincing him that Hollygrove needed its school. They did not succeed in making the school a “Quick Start” project, one of the very first to be rebuilt from Katrina damage. But at least it was in the second phase of rebuilding, meaning it was guaranteed money; at phase 3, the money ran out. Confident that their neighborhood would have a school again, Hollygrove leaders turned to the next question: Who would run it? Though the facilities master plan was a major accomplishment, it did not address a conundrum unique to New Orleans: Which school program would operate in each building? That’s one of the strangest elements of post-Katrina public education, the disconnection of school buildings and the programs inside them. In a typical school system, they are one and the same. If the school is failing, the school system’s leaders might replace the principal. Sure, there might be a special program with its own name housed in a larger school with another name, but there would not, however, be an entire school named Lafayette Academy housed in a building called Paul L. Dunbar Elementary. Yet Recovery administrators were moving toward an all-charter school system, independent programs run by independent boards, with public funding and oversight and assigned to public school campuses. They might continue to operate, or they might fail and lose their charters, to be replaced on the same campus by another operator. The buildings, such as Dunbar, would remain. It was like a game of Risk: The country lines would stay the same, but the occupying armies could change. So each building had to be assigned to a program. The facilities plan didn’t make those decisions. Recovery system officials had to look at its 65 campuses, or sites, and match them up with its 57 programs, in what has been called the siting process. That process didn’t start for several years. Basic services had to come first, said Ramsey Green, former Recovery deputy superintendent for operations. The state school system was constantly putting out fires, sometimes literally. One elementary school had multiple electrical fires in the middle of the night. At another building, students had to be moved out immediately when engineers discovered so much termite damage that one side of the floor was 8 inches lower than the other. And though the Recovery system didn’t want to run schools long-term, it had to do so until it could find enough good charter operators. So in the early years after Katrina, it was hiring teachers and building temporary facilities for students flooding back into town. Spending time on a long-term siting plan “would have been perceived by the public as a luxury,” Green said. In August 2010, five years after the storm and with FEMA on the verge of sending $1.8 billion to rebuild schools, the Recovery officials finally concluded they could start on siting. The task was dizzying. Six campuses were already finished — new or renovated — at a cost of $179 million, with school programs in them. Some other programs could be kept where they were, such as Lafayette Academy, with a building in good shape on Carrollton Avenue on the Gert Town-Hollygrove line. The other campuses had to be assigned, but this was not as simple as labeling pieces on a game board. Parents and teachers cared. So did alumni and neighbors, the people who had attended the school or passed by it every day. Each charter operator promised its own program and unique fillips. Would there be college pennants on the walls trumpeting the alma maters of the teachers and, by implication, the bright futures of the current students? Would every child learn an instrument or a foreign language? Would there be computer laboratories or a giant botany garden? Would they, the neighbors, be welcomed in to hold community meetings at night or sponsor tutoring sessions? To guide the decisions, Vallas, the Recovery superintendent at the time, set down five principles. The top priority was moving children out of portable campuses, those drab, temporary structures reminiscent of refugee camps. Those programs would be paired with the school buildings that were rehabilitated first. The second consideration was practical, matching up grade levels. Elementary programs would be assigned to buildings designed for younger children, with smaller lockers and lower bathroom sinks. And even though school-attendance zones had been abolished — any student could now apply to any public school in the city, regardless where the student lived — the Recovery system wanted to make life convenient for families. So the third priority in siting a program was where the majority of the program’s students currently lived. Fourth: What charter administrators wanted, and “community input.” For Dunbar, then, what Hollygrove wanted was tied as the lowest priority. In the fall and early winter of 2010, Recovery school system staffers assembled a rough draft of the siting plan and shopped it around at five public meetings and dozens of private ones. As people voiced their preferences, the staffers issued several revisions. But just as the siting plan was being finalized, it was shelved. The Recovery system had to revisit the building plan, to account for changes in demographics and financing. By the time that was done, 10 months had passed, 10 campuses had been added back to the map and five campuses had been deleted. That meant a mostly new team of Recovery system staffers had to revisit all those never-finalized siting assignments. Some schools were already dreaming ahead, posting schematics of their future homes on the wall and getting families excited. For that reason, the Recovery staffers’ new top priority was to stick to the existing assignments whenever possible. When changes were necessary, they followed Vallas’ guiding principles, with one new factor added up high: the program’s academic track record. The Recovery system at last adopted the official siting plan in December 2011. In Hollygrove, however, that process was long done. Before the Recovery system even set ink to paper for its siting plan, a network of community groups had gone out and chosen their own charter school program for the Dunbar campus. It would be Lafayette Academy, run by Choice Foundation. 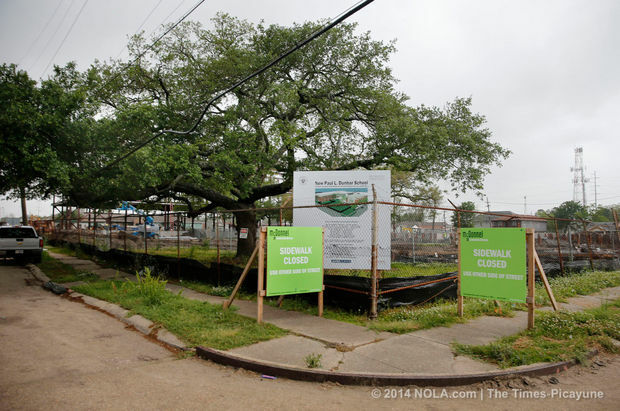 Lafayette, 2727 South Carrollton Ave., would expand into Dunbar and run it as a second site. This might not make it a “neighborhood school,” serving Hollygrove kids only, for in the post-Katrina world New Orleans students could attend school anywhere they were admitted. The average student lives almost 3½ miles from his or her school. Still, given Dunbar’s location, tucked away on a side street, Kevin Brown said there was no way it could exist in isolation; it had to be a resource after 3:30 p.m. He used to teach entrepreneurship classes at Dunbar. Organizations held meetings in the cafeteria. For such a small area, Hollygrove has a lot of organizations. The participants in the Dunbar search included representatives of Trinity Christian Community, Hollygrove Seniors, Hollygrove Neighbors, Nazareth Baptist Church, St. Peter A.M.E. Church and the Hollygrove-Carrollton Community Development Corporation. In 2009, Lafayette’s test scores weren’t great. 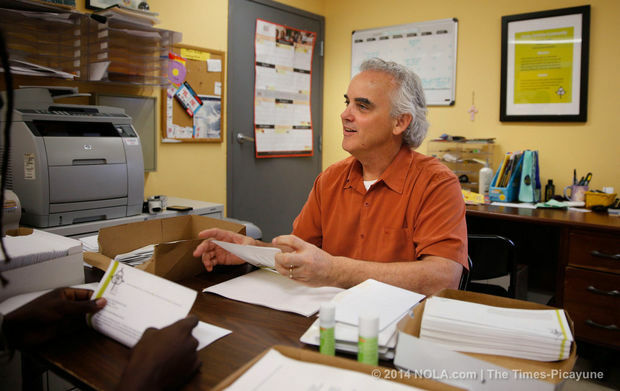 But Principal Mickey Landry, who doubled as Choice Foundation’s chief executive, had imbued the school with optimism since he arrived in the fall of 2007, pushing grades in the right direction. And the Hollygrove-Lafayette connection went beyond As and Bs. Trinity Christian Community held meetings at Lafayette and organized volunteers. Tutors and mentors from Hollygrove volunteered in the school, and school staff volunteered in the neighborhood – exactly the vision Brown, Sherman and the other leaders shared. On Oct. 16, 2009, after several months of conversations, Hollygrove leaders and Choice administrators celebrated the partnership. They held a meeting and party at St. Peter A.M.E. Church, with cake. Vallas himself attended, announcing the decision. In Brown and Landry’s minds, the “documentation” had already been written — in icing, on that cake from the previous fall. Its inscription welcomed Dunbar back to Hollygrove, and Choice to Dunbar. Now, everyone just had to wait, because Dunbar would not be rebuilt for several years. Vallas left, to be replaced by John White. Lafayette increased its enrollment to more than 900, the idea being that a portion of its growing student body would soon be assigned to the Dunbar campus. Finally, in late 2013, the reconstruction of Dunbar began, and Landry figured it was time to move. White by now was the state superintendent of education, so Landry wrote him of the Hollygrove party, when Vallas announced the Dunbar-Choice decision to the neighborhood. He added that “the largest percentage of Lafayette students live in that neighborhood.” Along with the Lafayette satellite at the Dunbar campus, Choice proposed to start a small program there for students with emotional disturbances. COMING FRIDAY: The neighbors rise in outrage, and a look at what went wrong. This story appears courtesy of The Times-Picayune. Reproduction is not permitted.